Econet S.A.L., Right & Rights S.A.L. Bassam Jaber holds a Bachelor of Science in Computer and Information Systems from the University of Michigan – USA. He has joined Cyberia since the very first days of its establishment in 1995, and held many managerial positions there. He worked closely with the Ministry of Telecom to initiate many Telecom laws and policies targeting the Internet and Wireless Data Licenses for Transmog Inc (Cyberia). 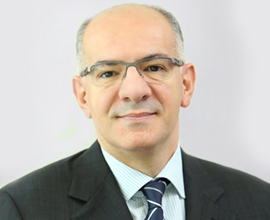 Bassam has over 20 years of experience in executive management, marketing, sales and business operations. Moreover, he has participated thoroughly in opening Saudi Arabia and Jordan Operations and initiated mergers and acquisition.